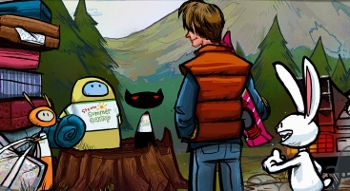 The 2011 Steam summer sale has launched with plenty of activities for all kinds of campers. Many of us are at the age where going to summer camp would be incredibly creepy, but Steam has us covered this year. From June 30 until July 10, the Steam Summer Camp sale is not only discounting a megaton of videogames in true Steam style, but giving customers plenty of activities to complete as if they were back in camp. If you've experienced a Steam sale before, you know the basics already. Every day, new games will be discounted at amazing to insane rates. Steam is also discounting feature packs like the Valve Complete Pack and the id Super Pack (which include multiple games) for the entirety of the sale, in addition to the entire catalogs of many different publishers. The fun comes in with activities that are similar to those from the Steam Treasure Hunt of December 2010. They're actually just achievements, but they come with extra bonuses this time. New achievements in specific games will be unveiled every day of the sale and they'll award customers with one ticket each. The tickets can be exchanged for unique DLC in a variety of games, including new maps, new missions, and cosmetic items like sunglasses for Team Fortress 2 characters. Each ticket also awards you with an entry into a drawing to win the top 10 games on your Steam wishlist. I still miss canoeing in a murky lake, but for adults this is about as close to going back to camp as we can get. Thanks, Valve.